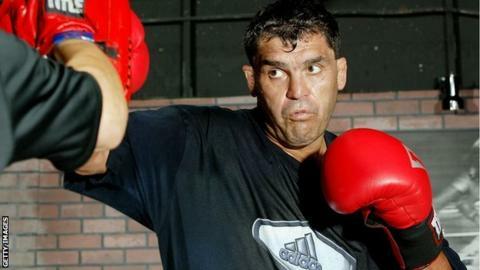 Former heavyweight world boxing champion Corrie Sanders has died after being shot during an armed robbery. The 46-year-old was attending a family celebration at a restaurant near Pretoria in his native South Africa. He died in hospital. Sanders pulled off one of boxing's major shocks when he beat Wladimir Klitschko to win the WBO heavyweight title in 2003. He retired in 2008, having won 42 of his 46 fights. A police spokesman said Sanders was attending his nephew's 21st birthday party when gunmen entered the restaurant. "In the midst of the celebrations, about three suspects came in," the spokesman explained. "They were planning to commit an armed robbery. Then in the armed robbery they shot randomly. Corrie was shot in the hand and also the stomach. Record: 46 fights - 42 wins, 31 by KO, four losses. "They fled with a digital camera and also a handbag of one of the people who was in the restaurant." Police have not yet made any arrests but the spokeman said they were "in hot pursuit". Sanders vacated the WBO title in December 2003 to concentrate on a challenge against Wladimir's older brother Vitali for the vacant WBC belt. But he was stopped in the eighth round of the fight at the Staples Center in Los Angeles. Sanders retired in December 2004 after beating Alexei Varakin in the second round of their contest in Austria, but returned to action two years later. He lost his final bout, against Osbourne Machimana, for the South African heavyweight title in February 2008.